PABLO -- Throughout the 23-year history of Mission Valley Power, its customers have benefited from a Bonneville Power Administration power supply contract that have kept electricity rates the lowest or second lowest in the state. But all good things come to an end - sort of. Ralph Goode, MVP general manager, told the 300 or so folks at the annual customer appreciation dinner last week that the rate MVP charges per kilowatt-hour is going up a penny this October. "On October 1, 2011 the new power price increase we've been talking about for a couple of years now will take effect," Goode said. Mission Valley Power gets 80 percent of its electricity from BPA. The rest comes from Kerr Dam with 19 percent and one percent comes from two small hydroelectric facilities on the Flathead Indian Reservation. "We will finally catch up to rate prices that others have been paying in the Northwest. Our rate increase from BPA is up 40 percent but even with the increase we will still have one of the lowest prices for power in the state." The one-cent per kilowatt-hour increase will mean that MVP will be paying $14 million annually for power that it is presently paying BPA $10 million for. That increase will be passed on to MVP customers via the penny per KWH increase. "The one-cent increase is not small," Goode said. "We've done everything we could possibly do to keep the increase as low as possible." This is the last year of a 10-year power supply contract that MVP entered into with BPA that essentially froze the rates at the 1996 level. However in that time span the electrical supply market became very volatile and rates in the Northwest and West skyrocketed. Also in that time period Montana witnessed the demise of Montana Power. That imbroglio left investors high and dry, and tossed a majority of Montana electric ratepayers to the will of the free market - remember Enron. Prices soared. Throughout all that MVP was the calm in the electric-rate storm. But now it is real world as MVP catches up with the rest of the utilities. Despite that MVP customers will still be paying among the lowest rates in the state. "I still think our new rate from BPA is still a good deal for us and our customers," Goode said. "Economically electricity is a very good deal when compared to heating oil and propane." A MVP household that uses 1,200 KWH per month presently pays $69.86. The penny per KWH increase that will add $12 to the monthly 1,200 KWH bill and bring it to $81.86. "We knew this was coming but we didn't know the impacts. We have been trying to do our business to keep our costs low," Goode said. "But what we are doing here is making a transition from our low price to the new rates. It's a significant increase but it is a one-time increase of that size." Goode said any future increases would be in the tenth of a penny range. 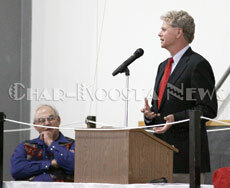 Bill Drummond, director of the Western Montana Transmission Group, gave the keynote address. "Our goal at the Western Montana Transmission Group is to help keep BPA power supply rates as low as possible," Drummond said, adding that MVP has been a leader in the region at keeping its rates low in comparison to others. "Until October 1 you will still reap the benefits of MVP's 10-year contract that froze rates at 1996 levels for 10 years. There was incredible savings of $24 million for MVP customers over the life of the contract." Drummond reiterated Goode's message that MVP customers will be paying rates more inline with the market but those rates will still be relatively low. "Starting in October MVP will join other utilities in western Montana with new BPA contracts," Drummond said. "Mission Valley Power will be allocated a block of power that is incredibly cheap but it will be more expensive than what you have been paying for the last 10 years." On the back of the rate increase is a new BPA time formula for contracts - each must be redone every two years. "It will cause some volatility and it will be a challenge for utility managers," Drummond said. "The power market is the most volatile and is traded hour-to-hour." Drummond suggested that MVP as well as other utilities would be wise to look beyond BPA for their electricity supply. Conservation measures are a way ratepayers can save on their power bills, he said, adding that MVP has been a leader in its conservation efforts. "What other resources are out there that are efficient power producers?" Drummond wondered. All forms of power-producing infrastructure require huge up-front expense outlays and many have shortcomings. Wind power: "Wind project costs have come down," Drummond said. "But the wind will not be there when you need it the most." Biomass: "The challenge is long-term fuel supply, long load hauls and U.S. Forest Service regulations," he said. Coal fired: "It's off the table," Drummond said. "No bank will finance a new coal fired plant." Solar: "We are still not quite there with solar yet because it is still expensive," he said. Nuclear: "It's not in the mix for many reasons," he said. "The earthquake in Japan put the dangers in the spotlight." Geothermal: "Technology continues to advance that makes it a feasible option for some," Drummond said. Storage of electricity produced by non-typical means remains a problem. "Battery technology is very inadequate for needed storage capabilities," he said. "The best way to store electricity is behind a dam." However, there are no plans for any such dams on the lower Flathead River. Goode said he was feeling charged up about the large turnout. "It is an awesome crowd. We are very excited they're here," Goode said of the approximately 300 people at the 23rd annual MVP customer appreciation meeting. "This is a tremendous turnout, the largest crowd we've ever had."